Partie de la Carte du Capitaine Cluny Auteur d'une ouverage anglois intitule American Traveller publie a Londres en 1769. A very interesting 1772 map of North America and Greenland, with adjacent parts of Europe and Asia. This map was drawn by Vaugondy to illustrate the mythical voyage of Captain Cluny. Depicts North America from above the Arctic Circle, to the Gulf of Mexico, including an embryonic depiction of present day Alaska. Shows a supposed Northwest Passage extending from Repulse Bay to the mythical Arctic Cape Fowler. To the east is Greenland, part of the European continent, and the northern portion of Africa. This map is part of the 10 map series prepared by Vaugondy for the Supplement to Diderot's Encyclopédie, of which this is plate 10. 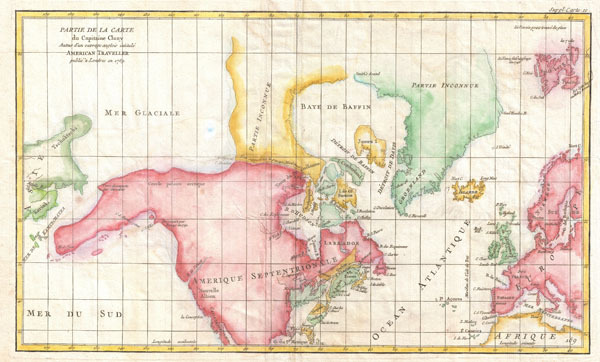 This seminal map series, exploring the mapping of North American and specifically the Northwest Passage was one of the first studies in comparative cartography. Good. Contemporary color. Original centerfold. Blank on verso.